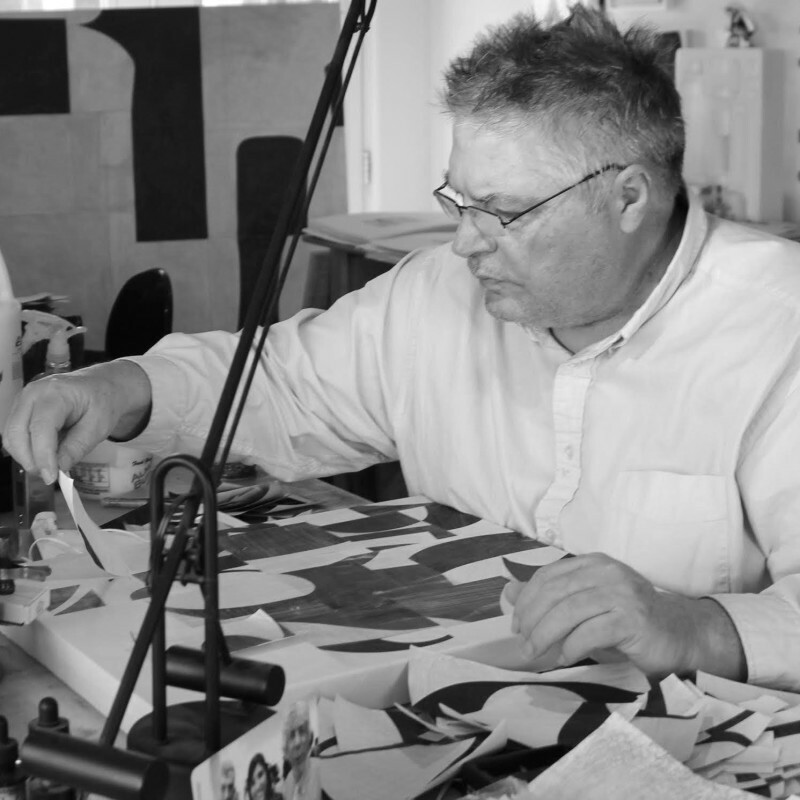 Cecil Touchon is a painter, performance artist, collector, draftsman, photographer, and curator. But it is through his collage work that he has made his most lasting mark. His collages are the seeds that grow into his other practices. Touchon's paintings are abstractions based upon typography. Using the techniques of collage, he reassembles portions of letter fonts from billboards and printed material into pure abstractions that transform verbal language into a form of visual architecture. His paintings use trompe l'oeil techniques to painstakingly create the illusion of large collage abstractions. They are characterized by warmly colored geometric shapes — overlapping rectangles and rounded wedges - that seem to revolve and recede into the background. The resulting works are a play of lightness and mass that are both visually striking and, because of the hints of letters, intellectually satisfying. Cecil Touchon was born in Austin, Texas. His artistic inspiration was ignited early and explored throughout his childhood and into his young adulthood. He received his BFA from the University of Texas at Arlington. Throughout his career, which spans over 30 years, Touchon has been collected worldwide and figures prominently in the Massurrealism movement. Touchon is a founding member of the 1987 Post-Dogmatist Group as well as a respected member of the Art Mail and Fluxus communities. Touchon's work was exhibited in the 2001 and 2009 Venice Biennale and can be found in more than 45 corporate and international collections.